Now that Mossberg has introduced its first handgun in 100 years, a lot of shooters are going to be looking for new holsters. DeSantis has jumped out quickly to offer numerous fits for the new Mossberg. 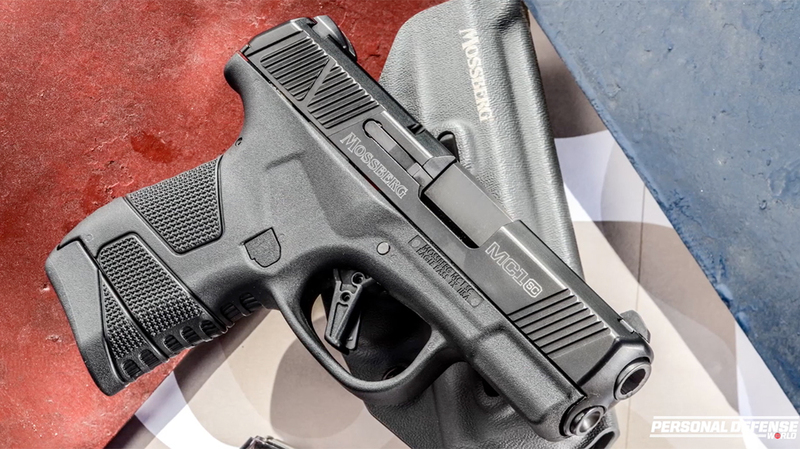 In fact, DeSantis has already introduced 18 different styles of Mossberg MC1sc holsters to fit practically any shooter’s needs at a variety of prices. Regardless of whether you prefer strong-side or ankle or IWB or OWB, DeSantis has a holster for you. This includes whether you prefer leather, nylon or even Kydex. And everyone one is available for a whole lot more handguns than just the Mossberg MC1sc. For more information, please visit desantisholster.com. Basic doesn’t mean bad, especially when talking about the Mini Scabbard. This basic holster features tough construction, precise Slickgun fit and minimal printing. Additionally, the Slickgun stays secured via molding and a customizable tension device. Accommodates belts up to 1 1/2-inches wide. MSRP is $63.99. Featuring premium saddle leather, double seams and a molded fit, the Thumb Break Mini Slide makes a great choice for your pistol. It also comes with an adjustable-tension device, and its two slots fit belts up to 1 3/4 inches. MSRP is $74.99. The Sof-Tuck is a tuckable IWB holster featuring an adjustable cant. Also, shooters can wear this holster on the strong side, crossdraw or SOB positions. DeSantis builds this holster from soft, no-slip suede that is reinforced at the top with saddle leather for easier re-holstering. MSRP is $34.99. The Inside is designed to minimize bulk while providing concealment and comfort. Made of soft and un-molded leather, it comes with a heavy-duty spring steel clip positioned high for deep cover. MSRP is $29.99. Featuring the DeSantis Tuck-able 360 C clip, this holster features unlimited positioning adjustment in IWB mode. 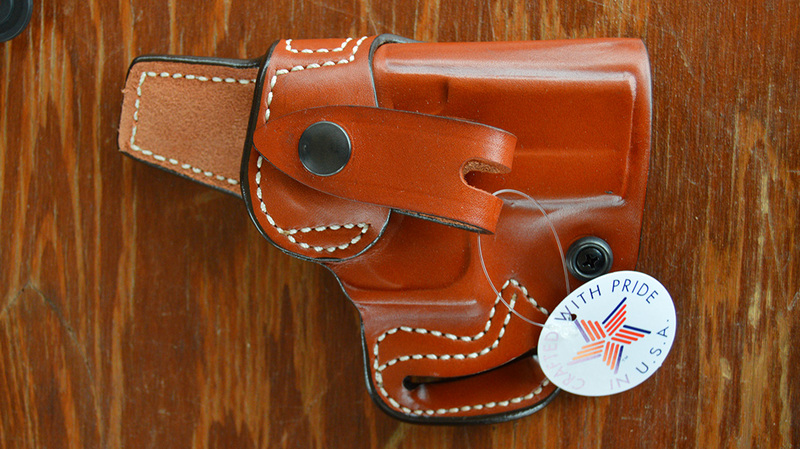 However, this soft, non-molded, leather thumb-break holster also comes with an integral belt loop for OWB carry. An optional J clip is available. MSRP is $34.99. DeSantis builds the Pro Stealth of 1050D ballistic nylon and lines it with slick pack cloth. It comes with a 1 3/4-inch, powder-coated black spring clip that keeps it secured to the belt. Additionally, the users can swap the clip for left-hand carry. It also comes with a spare magazine pouch for auto loader models. An optional thumb break is available. MSRP is $38.99. Built of heavily padded 1050D ballistic nylon and lined with slick pack cloth, this tuckable holster can be carried in crossdraw, strong side and SOB positions. The tab allows users to tuck shirts between the Slickgun and pants, providing near total concealment. Additionally, auto loader versions feature a magazine pouch built into the front holster spine. MSRP is $43.99. DeSantis crafts this barebones IWB holster from black saddle leather, with precise molded contours providing retention. The powder-coated spring clip keeps it secured to the belt, while the reinforced top provides easier re-holstering. It is available in black for both right- and left-handed shooters. MSRP is $41.99. DeSantis claims The Nemesis pocket holster provides immobility wherever you are mobile. The company used a technologically advanced material that is extremely viscous. This keeps the holster in place regardless of movement. However, the company uses slick pack cloth on the interior for a low friction draw. Additionally, its foam core keeps the Slickgun from printing. MSRP is $26.99. The Super Fly uses rubberized fabric to keep this pocket holster in place. Once positioned, it will not budge in the pocket. Also, a removable outer flap removes lines to disguise handguns. It also contains a slick pack cloth lining for a quick draw when needed. It is available in specific designs for either the front or back pocket. MSRP is $41.99. The company fashions this minimal ambidextrous IWB holster from Kydex. It features the tuckable 360 C clip, which allows unlimited mounting options. Additionally, the hardware can be reversed for left-hand shooters. MSRP is $39.99. Featuring a body pad built form edge bound neoprene, ballistic nylon and other synthetic materials, the Invader is an extremely comfortable IWB holster. However, the holster component is thermo-molded from Kydex. It also comes with glass-reinforced nylon C clips for durability. Users can easily adjust this holster using the included hex wrench. J clips are available separately. MSRP is $50.99. Adjustable for both height and cant, the Infiltrator Air features a front holster component built of precision-molded Kydex, while the back is a synthetic and breathable material. It come standard with tuckable C clips, but J clips are available. MSRP is $86.99. This minimal pancake holster is formed of precision-molded Kydex, with a leather and synthetic backing. This makes this two-slot belt loop OWB holster both compact and light weight. MSRP is $42.99. 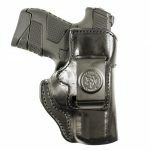 Featuring an OWB/IWB Kydex design, the Raptor comes with a curved back with most of the detailed molding on the outside. This provides comfort and concealability. It comes with two sizes of belt loops — 1 1/2 and 1 3/4 inches — or IWB polymer straps. It also features a trigger guard detent and rear sweat guard. MSRP is $79.99. This high-ride OWB/IWB Kydex holster is also pre-formed with a curved back for comfort and concealability. It also comes with two sizes of belt loops or soft polymer straps for IWB carry. But it features the self-locking Redi-Lok, as well as a sweat guard. MSRP is $83.99. The DS Paddle is light, durable and custom molded to pair with firearms. The company used Kydex because it can be molded with precision and it provides minimal friction during the draw. It uses a dual-tension device to keep guns secure, and it can be customized for both height and cant. Additionally, this holster comes with an optional belt attachment. MSRP is $47.99. The post DeSantis Releases 18 New Mossberg MC1sc Holsters appeared first on Personal Defense World.